One of the nice things about having a BC boy for a husband is the sheer amount of useless wild animal knowledge you collect. Or perhaps its useful if you are being chased by a bear, I haven't actually had a chance to test all this knowledge yet. But seriously, I now know a LOT about bears, moose, elk, bighorn sheep, caribou, cougars, wolves, coyotes and (hehe) marmots. My friend Mike has been lucky enough to see a family of bears, with a mama black bear with two kermode cubs. He's got some great, and super cute pictures of them here, if you want to take a look. My favourite is the one of this little cub, and its the picture I tried to recreate with my bear cookies below. 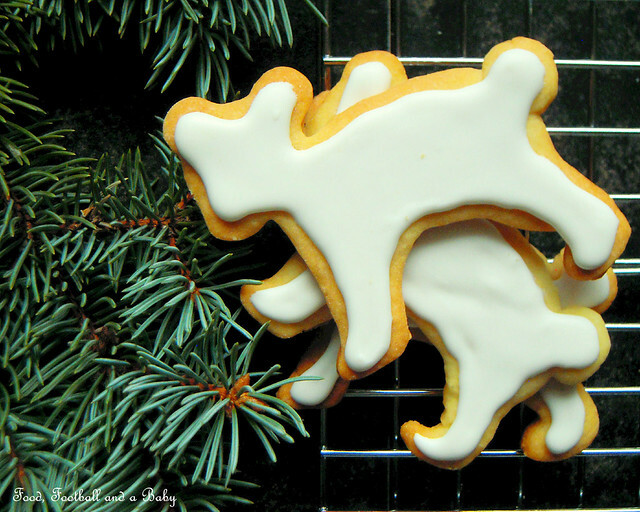 Spirit bear cookies... sorry... yes, coming back to these cookies. These buttermilk sugar cookies are from a family recipe, passed down to me by my dear mother-in-law. I'll be upfront and warn you, these are not for the impatient baker. The actual cookie dough is really easy to make, and the baking time is really quick too. The bit that requires patience is the rolling out and cutting into shapes and the icing. I am not known for my patience, and every Christmas finds me cursing away at these cookies, as I carefully attempt to roll out and cut these cookies out into the planned shapes. Last year I attempted a moose (I did too, check out the pic here)... and I can tell you, my swearing was worthy of Gordon Ramsay. This year, I decided to save myself the pain and went with these cute bears instead. The reason I call these cookies spirit bear cookies was thanks to Kay, actually. 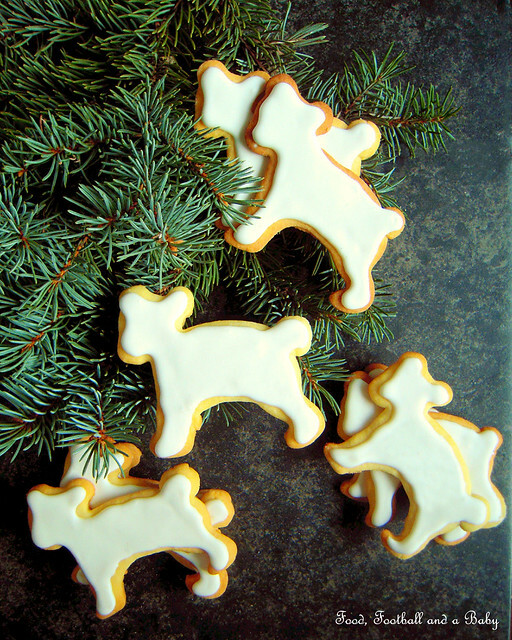 He looked at these cookies last night, and told me that they looked like little kermode bear cubs... awww! So 'spirit bear cookies' it is. I really liked how these little cookies came out, and they even got the thumbs-up from Kay. He did say his mum's were better though... but hey, I only just started making these, I think MIL has had about 30 years worth of head start on me... I'll get there eventually :-) The recipe has always been a winner for me, with crisp sugary cookies, but I never actually thought of icing them before (lazy, that's me) I am not the most creative person in the world, and I will freely admit that I don't have a single artistic bone in me... but I persisted with these and I am very pleased with the end result. Perhaps, next Christmas I will attempt making my own cookie icing, but for this year, storebought worked brilliantly. After all, this is still lazy me you're talking about, I can't be expected to do that much work now, can I? Haha. Cream the shortening and sugar until soft and fluffy. Add slightly beaten egg and vanilla, and whisk well. Stir in the baking soda into the buttermilk, then add to the above creamed mixture. Sift together 2 cups flour, salt and baking powder. Add to mixture. Stir in the lemon zest, if using. Add more flour, 1/4 cup at a time, so that dough will roll easily on lightly floured surface. I have noticed that I tend to use an extra 1/2 cup of flour to get the dough to this consistency, and I use the remaining 1/2 cup to sprinkle on the kitchen counter and rolling pin, so the dough doesn't stick. Roll thin, cut with cookie cutters into desired shapes. I made mine into bears. Using a flat spatula, tranfer on to an ungreased (don't second guess, I do mean no grease at all) baking sheet and bake at 375 F for about 8 -10 minutes taking care not to over brown the cookies. Once baked, very carefully lift off the sheet, and let the cookies cool completely before icing them. I used store bought white cookie icing to flood ice the cookies. These cookies can be frozen without the icing. Thaw before eating. Now this is what creating your own family Christmas traditions is all about, Michelle! 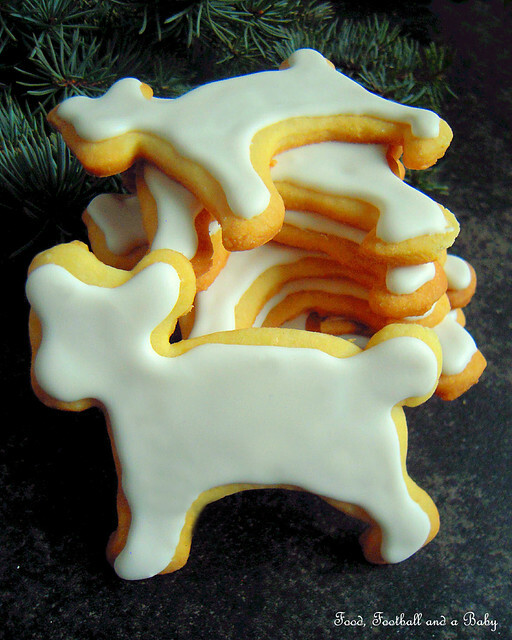 I am overwhelmed by the idea of a SPIRIT BEAR cookie for a Canadian Christmas. It is brilliant and your story ties it to your family roots - and combined with the Great Spirit Bear that is so much a part of our culture as Canadians, I am completely charmed and will be adding this idea to my family plate next year. I will use my grandmother's sugar cookie recipe - the one I use for my snowflake cookies... and maybe investigate the symbol for the spirit bear and see if I can learn more ... how completely lovely. Sooo pretty and the golden cookies look just wonderful tasting! I saw an article on Spirit bears in the National Geographic magazine a couple months ago ... so interesting and beautiful! You've captured them perfectly in your cookies! These are seriously cute and look delicious too. I greatly admire your wild animal knowledge, especially about knowing what to do when threatened. Not much danger round here, although some of the local cats look at me a bit oddly now and then. I loved the photos of the cubs. What a coincidence, I used the same cookie cutters on Saturday for the first time. They were originally bought as playdough toys for the kids. 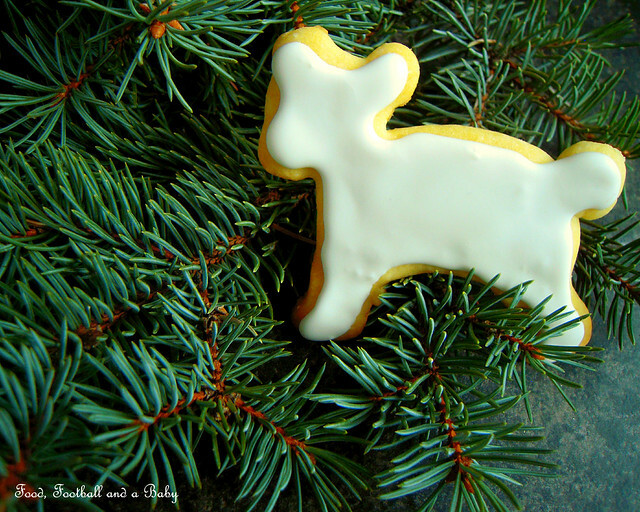 Very cute, will have to try your recipe next time as I used Joy of cooking's sugar cookie with orange zest recipe. 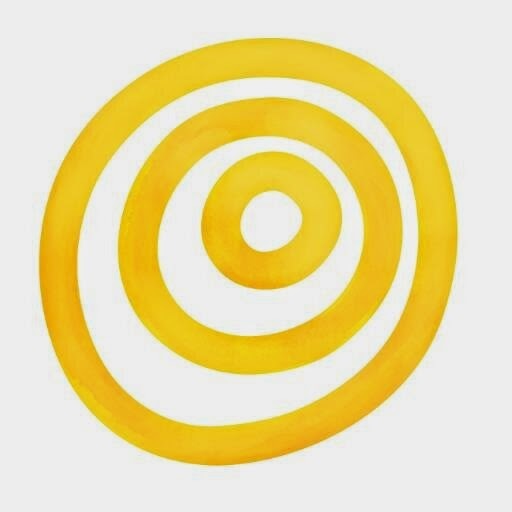 I have enjoyed reading your blog, keep up the great work!